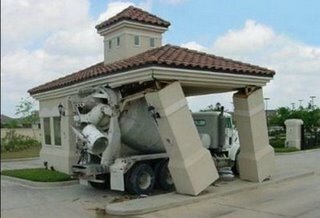 The driver of this concrete truck reportedly insisted on getting his triple espresso vente latte (very large container) and then paying for it, with a hefty tip, before escaping on foot where he remains at large. Which foot, was not disclosed. Authorities searching the truck's cab only recovered a Popeye Kahn lunchbox, apparently left behind by the unidentified driver. Some speculation also exists indicating the concrete truck may actually be the notorious "Kahn Mobile" in disguise-- but like most aspects of this case, the Kahn Mobile theory is only a theory and at this time unconfirmed. The contents of the lunchbox have not been disclosed, however one source did indicate fingerprints were traced to a "Bob Smith", with a last known address in Cleveland, Ohio. But ultimately, investigators seem only to find more dead ends, and have aptly labeled this case SmittyFactor , a yet unsolved and perhaps unsolvable case. The likelihood of an actual Bob Smith seems even more remote than the mystical Popeye Kahn guitar hero lunchbox character. As for the larger continuing mystery of Popeye Kahn-- and more importantly, the man behind the perplexing Popeye Kahn lunchbox... experts involved can only scratch their heads. For them, this remains an enigma. Reportedly, small groups of vigilant Popeye Kahn followers are sprouting up throughout the world, including an especially avid Brussels contingent who express cautious optimism at Kahn's ability to evade those who seek only to identify him.